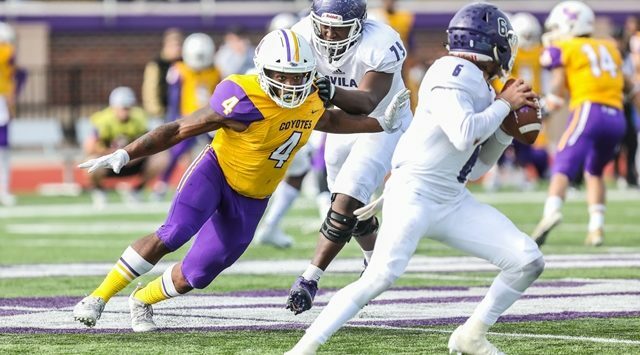 Kansas Wesleyan defensive lineman Shaq Bradford (JR/San Diego, Calif.) added another award to his already impressive list of honors for the 2018 season as he shared the top vote-getter honor at the NAIA level in the final voting for the Cliff Harris Award. The Cliff Harris Award is presented annually by the Little Rock Touchdown Club and Wright Lindsey Jennings, LLP. The award honors the nation’s small college defensive player of the year representing NCAA Division II, Division III and NAIA colleges and universities. In his first season at KWU, Bradford was an integral part of the success of the KWU defense that recorded two shutouts during the season and ranked No. 15 in the NAIA in scoring defense, No. 18 in total defense and No. 19 in rushing defense on the season. Bradford recorded 56 tackles on the season, which included 35 for losses that totaled 179 yards. He also had 22 sacks for 138 yards on the season. He led the NAIA in sacks and tackles for loss on the season. He also established new school and conference record in both categories, as well as new school and conference records for his 6.5 sack and 9.5 tackle for loss performance in the regular season finale against Southwestern on November 10. Bradford was also selected as a first-team All-KCAC selection and as the KCAC Defensive Player of the Year. He continued on to be named as a Second Team AFCA-NAIA All-American and a Second Team NAIA All-American. He was named as an Associated Press NAIA First Team All-American as well. Kansas Wesleyan had a historical season in 2018, finishing with a 13-1 overall record, which included an 11-0 run through the regular season. The Coyotes won their first KCAC Championship in football since 2002 and continued on to reach the semifinals of the NAIA Football Championship Series, becoming the first team from the Kansas Collegiate Athletic Conference to advance beyond the quarterfinal round since the FCS playoff format began in 1998. Washburn’s Corey Ballentine was selected as the overall winner of the 2018 Cliff Harris Award. The 6-0 195 pounder from Topeka, Kan, was an AFCA All-American cornerback in 2018 for the Ichabods and became one of the top kick returners, kick blockers and track sprinters in Washburn history. Ballentine will play in the 2019 Reese’s Senior Bowl in Mobile, Alabama on January 26, 2019. More than 5,000 defensive players from approximately 500 colleges are eligible to win the award. The $3,000 Cliff Harris Trophy will be presented by Cliff Harris at the Little Rock Touchdown Club’s annual awards banquet on January 10. Special guest speaker for the banquet is former Heisman Trophy winner, Super Bowl MVP and ESPN College Game Day analyst Desmond Howard.